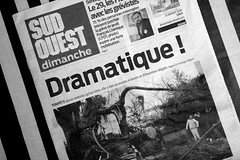 On Saturday the 24th of January 2009, very strong gales (later nick-named ‘Klaus’) caused serious damage across the south-west of France and Northern Spain. 60% of the forest of the Landes (consisting almost entirely of pine trees and one of the largest in Europe) was destroyed, 11 people killed in France (with more in Spain) and 2 million homes without electricity. The region, its rail network was severely damaged, was cut-off from the rest of the country. One week later, 44,000 homes remained without electricity and the local economy has been severely affected. I was in Pau (a city in the south-west of France, in the Pyrénées Atlantique / Béarn area) that weekend. Luckily, Pau escaped the worst with just a number of fallen trees. However, I found myself marooned as the rail networks and public transport ground to a complete halt. Finally, I was able to reach Bordeaux on one of the first replacement coaches which crossed this scarred landscape. Here is my little journey…. (Sorry for the dreadful quality of the photos! ).